In a large bowl or zip-top bag, stir together the smoked paprika, cumin, salt, pepper, cayenne and garlic, along with the zest from the lemon. Add 1/4 cup olive oil, stirring until you have a smooth, runny paste. Juice the lemon into a separate bowl. Spoon in 2 tbsp of the paprika mixture and stir until combined. Set aside. Add the squid to the remaining paprika mixture, and toss to coat evenly with marinade. Cover bowl with plastic wrap (or seal the bag, if using) and refrigerate for at least half an hour to marinate. While the squid is marinating, soak the skewers in cold water to prevent them from charring, and get the grill started so that it has time to preheat. When ready to cook, gently thread the squid bodies and tentacles onto skewers (I like to use two skewers to prevent the food from spinning around, but it’s not totally necessary). 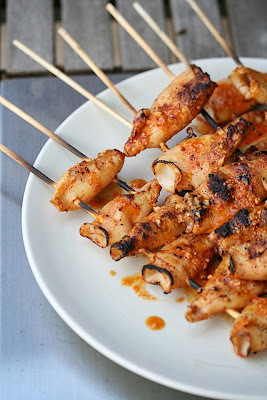 Place the skewers directly onto the preheated grill, and cook for about 2-3 minutes per side or just until the squid turn opaque. Remove from heat right away, and drizzle with the reserved marinade. Garnish with lemon wedges. Serve piping hot with a loaf of crusty bread to mop up the sauce.